One small (1-oz) pack of these Mini Pops is only 100 calories, yet surprisingly quite filling. They're also higher in protein, fiber, and iron than popcorn. Although Mini Pops claims to not have any hulls (because it's not corn), I did find little hull-like pieces getting stuck in my teeth. Not in the painful, choking popcorn way, but like little tiny hull remnants. Still, much better than popcorn though. Because the pieces are so tiny, and I found them to get in the tiniest of nooks and crannies, I don't think these would make for a good car snack, but imagine all your new movie possibilities. 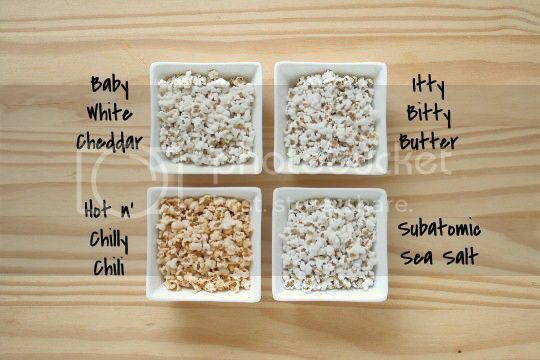 Instead of shelling out loads of cash for buttery, fatty, overly salted popcorn, take a few bags of Mini Pops with you or an even better snack. They come in a multitude of flavors, including Itty Bitty Butter, Baby White Cheddar, Hot n Chilly Chili, Subatomic Sea Salt, Cutie Caramel Clusters, Nano Pepper and Herb, Itsy Bitsy Chili Cheese, and Plain. One-ounce packs retail for $1.19, and 3-ounce packs retail for $2.99 (sure does beat a $10 bucket of popcorn!). Of the four flavors I tried, this was probably my favorite. It had a mild salty, cheesy flavor reminiscent of white cheddar flavored popcorn (that dusty, powdery stuff we've all tried at least once). A very light butter flavor, like movie popcorn that went very easy on the butter and salt. This would definitely be the flavor to sneak in at the theaters, as it's the closest one to what you'd be expecting. When I first tasted this, I thought, "Oh, plain popcorn." Unfortunately, all of that delicious sea salt falls to the bottom of the bag and isn't evenly distributed, even when you shake it up. So in the end, you're left with a handful of salty pops crumbs. This slightly spicy, cumin-flavored variety definitely packed the most punch of the four. I thought it could be a bit saltier, but then, it's probably all at the bottom of the bag (I haven't finished this one yet!). 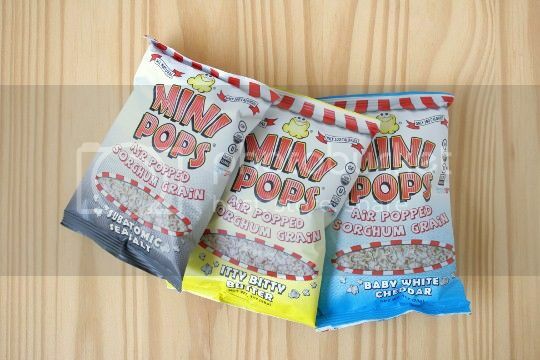 Overall, Mini Pops are a good healthy substitute for popcorn. They're definitely worth stocking up on to fight popcorn movie prices!